Learn how to set up our Pistol Petes onto a Spinning Rod! Now, you'll learn a great technique of how to fish with our flies! PISTOL PETES are proven to be consistent producers. The propeller on PISTOL PETES attracts the fish's attention and triggers strikes because it combines both "action" and "sound." Many anglers fish PISTOL PETES with a light spinning rod using a "fly and bubble"
another effective way to fish them in lakes. small lure. You will often get strikes as the PISTOL PETE swings with the current. 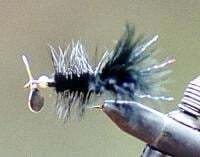 You will also get strikes as you strip the fly back upstream after it has completed its swing. You should use a small ball bearing swivel on the end of you leader if you are fishing in fast current, otherwise you will get leader twist (especially if you are using the larger Salmon/Steelhead and Saltwater/Pike Pistol Petes). Many anglers also have had good success trolling PISTOL PETES behind a boat. Placing a small split shot about six inches in front of the PISTOL PETE helps get the fly down. The pitch of the propeller can be changed to allow it to spin at the speed you desire. Experiment, you may find a fast propeller works better for you.